Light up your work just where you need it. 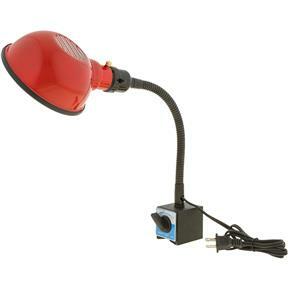 Flexible neck lamp features magnetic base that attaches with the twist of a switch so you can use it on every machine. But what the heck, at this price, buy one for all your machines! 110V. Maximum 60 watt bulb. This light base attaches right to my band saw and puts the light right where I need it! Great product! Product very usfull on my wood lath. But not happy about my orders. Tock 2 months for lamp to be depraved. Ordered several items in January. Still have not received the 3 lathe tools I ordered! I use a LED 100w bulb and the unit provides ample light. I do have 2 minor negatives: 1) the rubber edging around the shade did not want to stay on. I fixed the issue with hot glue. 2) The shade would not stay in place on the socket bolster (too loose). This was fixed with a tie-wrap. Other than that, I like the unit and the magnetic base is strong. It is magnetic so you can stick it to any steel machine and put light where you need it! Best light I have. I put it on my vice to sharpen chainsaws. The magnet has an ON/OFF switch, doesn't budge when on.. The only thing that would please me more than this light would be if you would share on of your 2017 catalogs with me as requested at the time of the order. For your convenience you may send it to me at my billing address, should you choose to do so. This light has been a very good investment for my bandsaw and makes for a much safer work invironment. This is the best accessory I've got. Using regular shop lights for years, this light really allows me to focus on the project. I bought it just for the band saw, but now use it for the drill press, lathe, table saw and any other place where light is needed. I didn't know what I was missing.